This is a humpback whale. It is also, to the best of my knowledge, the first one ever documented alive in Sri Lanka. On 21 February this year, I caught a brief glimpse of a fluke in the distance, out of the corner of my eye. The part of my brain that operates on gut-instinct screamed "humpback whale!" My rational brain countered with: "No, that's not possible. There are no humpback populations here." And that was that. Sort of. 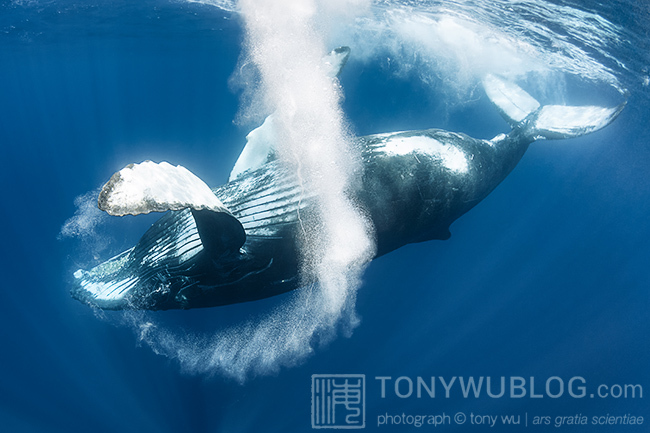 I turned to May, a friend who has traveled to Tonga with me several times to hang out with humpbacks, and asked her: "Did you see that? It looked like a humpback, but it can't possibly be. What do you think?" She said she had not seen what I had, so I asked her to keep an eye out for the mystery cetacean. I followed with, "That dorsal fin sure looked like a humpback's, nothing like a blue whale's." A few seconds later, a blow went up and a dorsal fin cut the water, no more than 20m away. It was heading straight toward us. The timing was blow...dorsal, not blow..........................................................dorsal, as would be more typical of a blue whale, given the considerable distance between a blue's blowholes and dorsal. "That's either not a blue, or it's the smallest blue in history." I blurted out as we donned our gear and eased into the water. It was nice day, sun out, seas calm. I took a quick breath and went down to about 10m. Whatever we had seen had dived, so I expected it to be at depth. I just didn't know how deep. A blue in the area typically heads straight down to forage for food. At body lengths of 20m or so, a couple of kicks is all it takes for a whale to descend into the abyss. So if what we had seen was a blue, there was little chance of encountering it. Almost immediately though, I saw a nose cone start to materialise though the misty blue haze. I've spent enough time among humpbacks to know one as soon as I see it. My rational brain tripped over itself to switch positions and concur with my impetuous side: "Humpback! Humpback! Humpback! It really is a humpback!!!" I thought, as giddy as a kid who thinks he's just seen Rudolph wink while flying past. And within a few seconds, the entire whale became visible. We came together, cruising slowly past each other, one species eyeing the other, both pondering exactly the same thing: "What in the world are you doing here?" One thing led to another, and the whale ended up inviting us in for a bit of recreational time. Yes, he (I had determined it was a young male by then, about 8-9m in length) surfaced a few metres away from our boat, slapped his fluke and waited patiently for us to get in. At which point, he swirled and swished around, making sure to slow down from time-to-time to allow gangly humans to keep pace, swinging by now-and-then to check up on us. Exactly how long this went on I don't recall, but it was long enough for us to be thoroughly exhausted, panting and heaving for every breath. The encounter itself was incredible, but what makes it all the more special is that my rational brain's initial reaction was correct. There are no known humpback whale populations in the area, and there really isn't any practical reason for a humpback to be where this one was. So what was this whale doing here? By itself nonetheless? Where was it heading? And why?! I contacted Asha, who confirmed that the sighting and encounter were unique. She helped me check the scientific record for previous humpback whale sightings in the area. Her response: "There was a stranding in 1981 and then a sighting in 1856 or so off Colombo and potentially another sighting in the south which I'm trying to confirm." Asha then contacted researchers in Oman who are working with the small population of non-migratory humpback whales in the Arabian Sea. The people over there have an extensive database of fluke photos. The Arabian Sea humpback population is the group closest to where this encounter took place, so perhaps, we thought, this was an adventurous young man that wandered off for a look around the neighborhood, so to speak. We were all keen to see whether there was a match, but...as it turned out, there wasn't. Sigh. A negative outcome is often as interesting as a positive one, however. In this instance, the lack of a match between the whale I encountered and the records from Oman means that where this whale was from, how it got there, where it was going, and why it was where it was...all remain a mystery. Maybe we'll see more humpbacks in the area in the future, or maybe not. Perhaps we'll solve the mystery, or perhaps it'll just be one of the many perplexing things about life on earth we never figure out. In either case, one thing this experience highlighted for me is the importance of working together. None of the people involved could've connected the dots and cobbled together the narrative above alone. 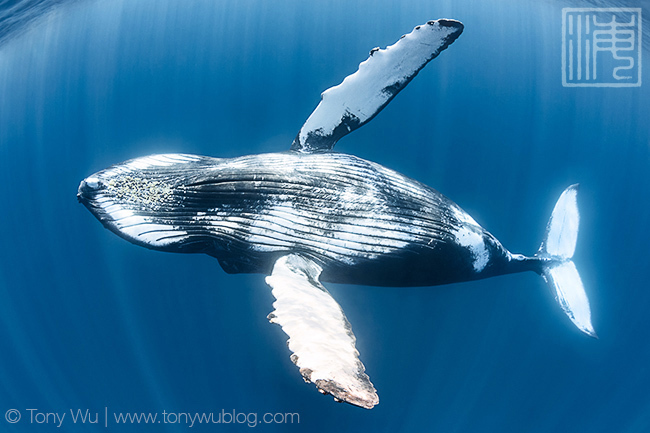 This image of a juvenile humpback was captured by Tony on 21 February 2014. While a resident population is known from the waters of the Arabian Sea, records of this species in Sri Lankan waters are uncommon. When Tony forwarded the image to me at The Sri Lankan Blue Whale Project we immediately approached the Environmental Society of Oman (ESO), who maintains the photo ID catalogue for humpbacks of the Arabian Sea, to match this individual with those in their population. We were curious to find out if this individual had strayed from the Arabian Sea into our waters and wanted to try to retrace its watery steps. We were pretty hopeful, knowing that the resident Arabian Sea subpopulation was well documented. Surprisingly, we didn’t find a match in the ESO catalogue, which leaves us questioning where this individual came from. More mysteries to solve! The key thing is that collaborations of this nature, amongst different stakeholders, across ocean basins are key to expanding our knowledge and truly understanding the secret lives of these giants. Incidentally, this isn't the first time in recent memory when a representative of a whale species has turned up in an unexpected location. In May 2010 and May 2013 respectively, gray whales were photo-identified in the Mediterranean Sea and off the coast of Namibia. The thing is, gray whales have been extinct in the Atlantic since the 1700s, and they have never been seen in the southern hemisphere. If you want to read more about these two fascinating reports, click these links: Gray whale ( Eschrichtius robustus) in the Mediterranean Sea: anomalous event or early sign of climate-driven distribution change? ; and Namibian Dolphin Project. There are at least two recent strandings of humpbacks from Sri Lanka. Ilangakoon (2002, 2006) reported two stranded humpback whales in Sri Lanka. These strandings are: (1) a specimen 39 ft 6 in (12.04m) in total length on 22 January 1981 from Chilaw, and (2) a 28 ft. (8.53 m) whale from Palliyawatte/Hendala on 21 April 1990. Photographs of the Chilaw specimen were published by Reeves et al. (1991) and de Silva (1987, 1983), and these authors reported the specimen stranded after it became entangled in fishing net. And there might be a third one.